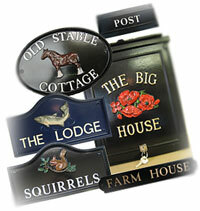 Hayne-West manufacture a wide range of standard and custom signs & plaques. Whether you are looking for a number plaque, a plaque bearing a message, a narrow gate sign with your house name, or a larger sign to accommodate your house name and/or other wording, with maybe an emblem, we have an extensive range of pattern shapes and sizes to choose from. Our range also includes patterns suitable for use as commemorative plaques and other special plaques, such as pet memorial, stable or kennel, and for marking special occasions such as birth, wedding, anniversary or Valentine’s day. The shapes available in our range can be seen by browsing the main categories on the right. For sizes, please refer to our list. Our Gallery page also showcases a sample selection of some of the signs and plaques we have made, which show various shapes, layouts and colours. For more help in choosing, please refer to our Tips on choosing your sign and FAQ's page which answer favourite questions and provide some useful practical advice including fixing and aftercare. Please remember that our experienced professional staff are only a phone call away and are always anxious to help in any way. Call us on: 01600 890 119.